Qualification:- Bachelor of Dental Surgery (BDS) Registration with State Dental Council. Desirable relevant experience in Govt/Pvt Institutions. How to Apply: Walk-in Interview Date and Time: 13.12.2018 10.00 a.m. onwards. Venue: Committee in the O/o Mission Director, NHM Punjab, 5th Floor, Prayas Building, Sector 38-B, Chandigarh. 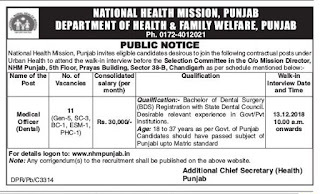 0 Response to "Punjab NRHM Jobs 2018-19 For 11 Medical Officer Posts"